Pausing on a footbridge in the Goyt Valley during the warm spell of weather in February. 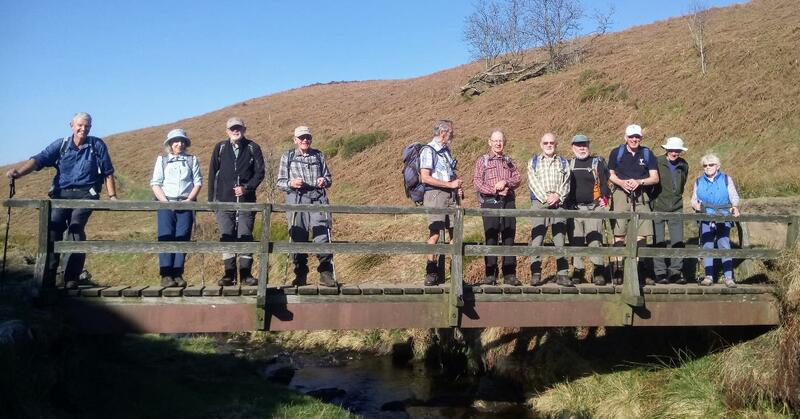 A group of 12 ramblers set off from Pym Chair on a bright sunny morning with a cool breeze which turned into a very warm day. Those in shorts were correctly clad and others soon peeled off gaiters, fleeces etc. Pym chair is so named as there was until 1838 a rock chair at the location. Unfortunately it was broken up and used to mend the road. One explanation for the name is that Pym was a highwayman using the chair to look for packhorses laden with purchases and then send his men to plunder them. The walk set off along the ridge to Windgather Rocks where we went below the rocks to look for cross bedding and other geological structures. Disappointingly there were no rock climbers so early in the morning. On descending into the Goyt valley, we passed two reservoirs. The first, Fernilee, was built in 1938, and beneath the water near to the dam are remains of a gunpowder store. The nearby mill suppling gunpowder for use against the Spanish Armada. The second reservoir, Errwood, was built in 1967 to supply the developing towns and villages in the area. Having crossed the dam wall the walk continued south above the reservoir and then over high moor with plenty of shooting butts descending to cross Goyt’s Clough and rise steeply to reach Shining Tor at 559m. It was then a 2 mile ridge walk over Cats Tor back to Pym Chair. A superb day with spectacular views both in the distance and of the reservoirs.